France weathered its worst riots in more than a decade Saturday as “yellow jacket” protesters continue turning parts of Paris upside down over concerns related to high gas taxes and the high cost of living. French riot police closed popular tourist areas and fired tear gas as they tried to quell the chaos in the streets. 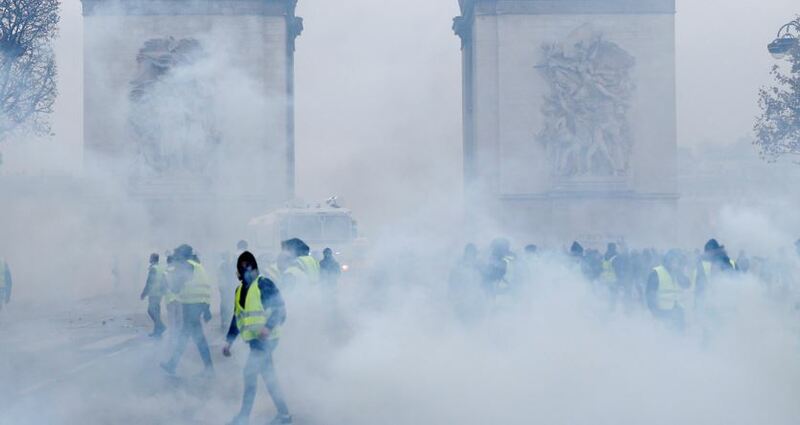 At least 110 people were injured while protesters associated with the grassroots-driven demonstrations clashed with authorities and vandalized the Arc de Triomphe. Much of the anguish stems from citizens’ disdain for French President Emmanuel Macron’s high gas taxes and overall war on fossil fuels. The beleaguered president denounced the violence in a statement crafted during the G-20 summit in Argentina. ″(Violence) has nothing to do with the peaceful expression of a legitimate anger” and “no cause justifies” attacks on police, Macron said Saturday night in Buenos Aires. The violence contrasted with protests from elsewhere in the country where “yellow jacket” demonstrators peacefully protested and erected road blockades. 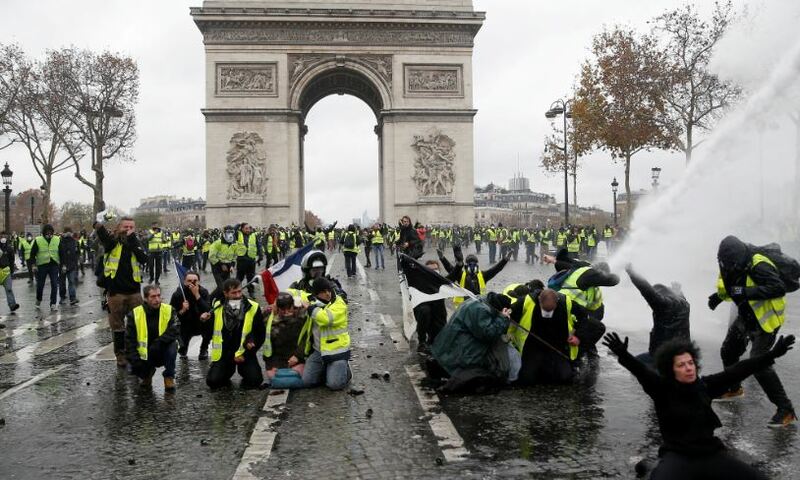 Paris police said at least 110 people, including 20 police officers, were injured in the violent protests, which originated Saturday morning near the Arc de Triomphe and continued into the night. Protesters meanwhile continue to air their grievances. “It’s difficult to reach the end of the month. People work and pay a lot of taxes and we are fed up,” Rabah Mendez, a protester who came from the French suburbs to protest in Paris, told The Associated Press. Macron enacted sky-high gas taxes to tackle what he believes could doom humanity within the next decade: global warming. But many French citizens see them as an example of the French president’s inability to understand the plight of the country’s working class. Denmark’s government presented a plan in October to ding all such vehicles by 2035. The plan is to curb vehicle pollution and combat climate change. Macron, for his part, issued a freeze on any new oil and gas leases in 2017 and intends to ban all oil and gas drilling by 2040.